Cane Creek Monthly Meeting is near Snow Camp, Almance County, North Carolina. 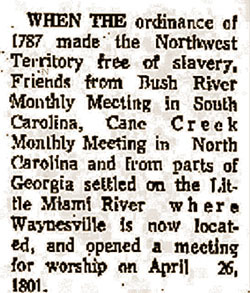 The first Monthly Meeting at Cane Creek was held on October 7, 1751. There were 30 Quaker families in the area. Jones, Aaron Chester, PA b 1728 30 Jul 1728. son of Richard Jones and Miriam Coppock. Long, John & Mary C.
In 1764, William Marshall and his wife Rebecca Dixon donated twenty-six acres for the meetinghouse.